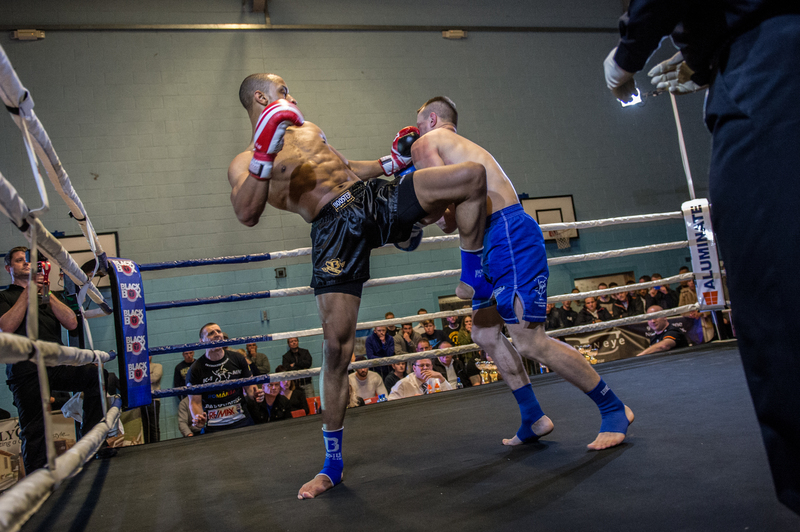 For more than 15 years, the twice-yearly fight nights promoted by Suggy’s Gym have been a launching pad for the careers of some of the best amateurs and up and coming professionals in the world of K1 and kickboxing. Chad ‘2 Slick’ Sugden was the first to open the door, becoming the highest ranking UK fighter of all time, defeating Atakan Arslan and Murthel Groenhart to reach number 2 in the GLORY rankings before switching to professional boxing last month. 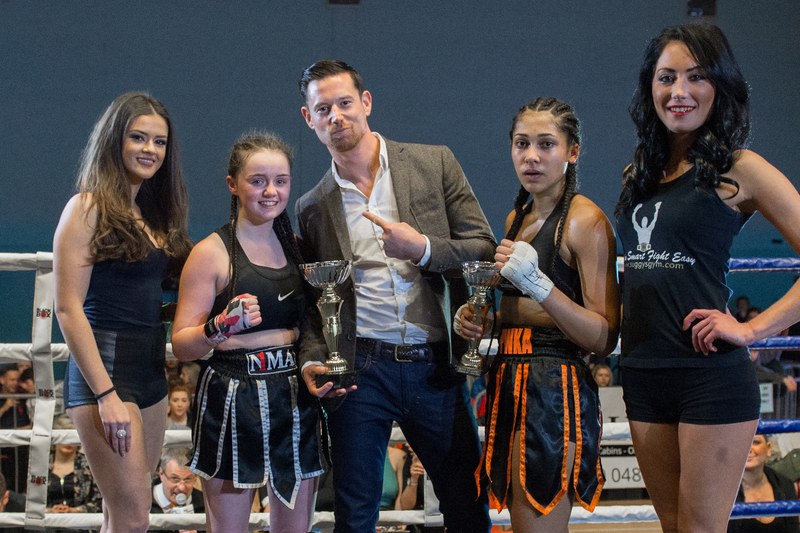 On Saturday 16 April, The Road To Glory 2 lived up to all expectations once again, showcasing local talent in an adrenalin-fuelled evening of action and entertainment at the Magnus Sports Centre. The show started with a great display of Full Contact from Sam Hardy who was up against a taller, older opponent in Kyle Russon from Wolverhampton’s Eclipse Gym. Never afraid to shy away from tough fights, NMA’s youngsters always rise to the challenge, knowing they are certain to face such opposition at some stage in their fighting careers. Fighting well over the three rounds, Sam was unlucky to lose on points. Next up was the mighty Megan Williams, fighting under her favourite rule set of K1 against 16 year-old Tenika Atiako from PWA. The battle went all the way to the last round, in which 14 year-old Megan attacked ferociously to take the win for NMA. The third and final junior match-up of the night saw Riley Church (13) making his Road To Glory debut against Team Mafia’s Ryan Evans at -53kg under K1 amateur rules. It was another tough contest for the home club but Riley out-gunned his 15 year-old opponent in the first two rounds before digging deep in the third to come through victorious on points. In yet another hard fight, NMA’s Connor Meanwell was effective but struggling with the weight advantage of Red Dragons’ Richard Keeler, who pushed and pressed to defeat Connor. The 4th Dimension young prospect Jay Glenn had jumped in at short notice to take on NMA’s Carl Thorpe. The Nottingham fighter came out all guns blazing but a strong and organised Carl caught him with a head kick in the first round, knocking him to the floor for the count and making easy work of a game and quality opponent. Both of the home club’s next two bouts ended in a loss. Kristian Kraatz appeared to be making a real fight of it against 4th Dimension’s Kane Birring, until he was caught with a stunning head kick and failed to beat the count. 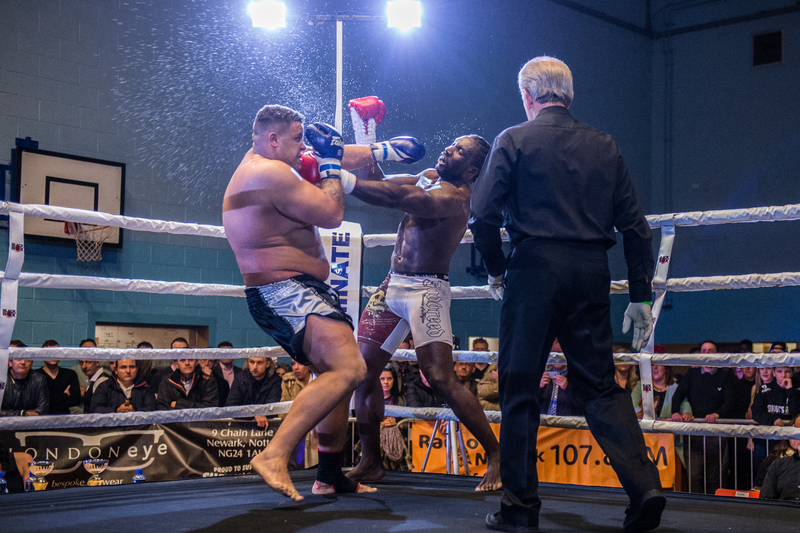 And more bad luck followed when Tom Mulligan lost his -91kg boxing match after struggling to get into the pace of the fight with Leicester-based Rayyan Mughal. With three fights left on the card, the atmosphere was electric as Bailey ‘BadBoy’ Sugden made his flamboyant entrance. Representing Suggy’s Gym and making the switch from K1 to boxing for the night, the local favourite was fighting at a heavier weight than he is used to but soon showed he was unfazed by the changes. 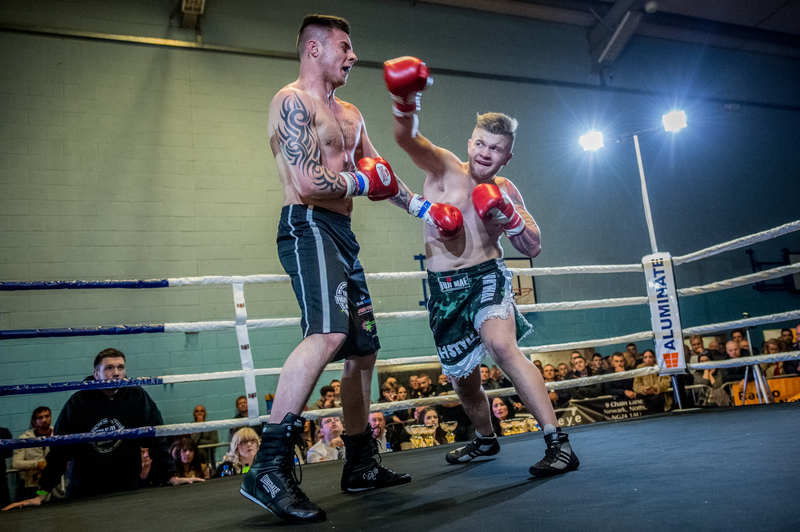 Up against a late replacement in Elite Fight Academy’s Jack Godber, Bailey landed some ferocious punches to the body, forcing Jack to the floor before putting his foot to the pedal to knock his opponent to the canvas for the final time, when referee John Blackledge brought the fight to an end. Headlining the night were two professional K1 bouts, the first at -70kg between Ammari Diedrick from 4th Dimension and Alexandru Marton from Firekick in Romania. In three fast and explosive round, Alexandru gave no indication of the fact that he was a late replacement on the card, coming back and trying to fight fire with fire. Ammari forced some counts on his opponent but had to contend with going the distance in what was a great win for another rising star from the Nottingham club. The evening came to a close with the much-anticipated clash between Suggy’s Gym’s Celio Wager and Jeffrey van Overbeek from Hemmers Gym in Holland, a tough first professional fight for Celio against a strong and heavier opponent from one of the world’s most famous gyms. Celio was off to a quick start, landing good punches and kicks, but Jeffrey kept coming and the constant pressure caused the local man some problems towards the end of the first round. Confused and tired, Celio regrouped but Jeffrey picked up on his fatigue and distress and landed a tremendous kick after a barrage of punches to fell the Suggy’s Gym fighter, who was unable to make the count. “Despite the fact that it ended in a defeat for us, this was an incredible fight to finish the night,” said Suggy’s Gym head coach Dean Sugden. “Overall we ended up with four wins and four losses for Newark but the crowd saw some excellent performances here tonight. “The fans know that the fights we put on are 50/50 contests, that sometimes the odds are stacked against us – but that’s what keeps them coming back to our shows time after time. “With Chad’s success on K-1 Global and Glory and Regis’s success with BAMMA, Suggy’s Gym is now firmly on the combat world map. All eyes are on these shows in Newark and with other fighters from Hemmer’s Gym on Glory Copenhagen and Bellator over the same weekend, there was massive exposure for everyone on the card tonight.